Photographing revolutionary movements seems to run in Gustavo Vilchis' family. Four generations ago, his great-grandfather snapped a picture of Emiliano Zapata. Vilchis, a 29-year-old photographer and human rights activist from Guerrero, Mexico, keeps the photo of the mustachioed Mexican revolutionary hero taped to the inside cover of his notebook. The Zapata photo is part homage to Vilchis' great-grandfather, Amando Salmeron — but it could just as well be a testament to revolution itself. "Next year will be the 100th anniversary of the Mexican revolution," said Vilchis, in an interview at the kitchen table of a Bronx apartment where he was staying during a recent visit to the United States. "And the way things are now, everything in Mexico seems to be adding up to a popular uprising: poverty, lack of opportunity, corruption, impunity." For the last two years, Vilchis has been documenting a movement he believes could grow into the next Mexican Revolution. After the government's brutal crackdown on a teacher's strike in Oaxaca in 2006, he traveled to the region, to photograph the hundreds of thousands of angry Oaxacans protesting the state's repressive tactics. The protest movement eventually coalesced into an umbrella organization called the Assembly of the People of Oaxaca (APPO), which demanded that Oaxaca state Governor Ulises Ruiz Ortiz be removed, and that a popular assembly be created to better represent Oaxacans. 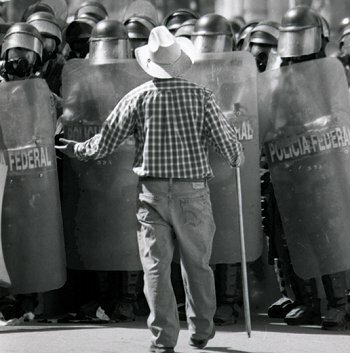 Vilchis' photos feature prominently in the book "Teaching Rebellion: Stories From the Grassroots Mobilization in Oaxaca," of which he was a principal author. The black and white images show police in riot gear facing off against protesters on barricaded streets, and a family mourning over an open coffin. His great-grandfather photographed a legendary leader, but Vilchis focuses on ordinary people — families, teachers, police officers. According to Amnesty International, violent clashes between police, paramilitaries and the APPO led to the deaths of at least 18 civilians between 2006 and 2007. Hundreds more were injured and arrested. Most of those killed in Oaxaca were unknown outside their own communities. But the death of a 36-year-old freelance journalist, Brad Will, on October 27, 2006, sparked an international outcry against the violence in southern Mexico. Vilchis had been photographing the conflict between paramilitary forces and APPO protesters when Will, who was standing nearby, was shot twice in the chest. Vilchis helped carry Will out of the line of fire to a waiting car, but he died on the way to the hospital. In March 2007, Vilchis testified before the office of the Attorney General (the Procuraduría General de la República) as a witness to the shooting. Vilchis said he met Will two weeks before his death, and was impressed by the American journalist's courage. "I think Brad's murder was a message to independent journalists to stay away," he said. Vilchis' own role as a photographer has become far more complex than he ever imagined. As he participated in a book tour for "Teaching Rebellion" in October 2008, he discovered that the Attorney General's office had just issued a warrant for his arrest. The charge? Covering up Will's murder. "It's ironic," said Vilchis. "I was one of the first people who testified before the Office of the Federal Attorney General as a witness to Brad's death." Vilchis later found out that Juan Manuel Martínez, another protestor, had been accused of killing Will. Two more protesters were charged as accessories to murder, and three others face coverup charges. All seven men had been by Will's side the day he was shot. The Attorney General's office contends that Will was shot at close range, supposedly by a member of the APPO hoping to draw international attention to the conflict in Oaxaca. In late September 2007, Mexico's National Commission for Human Rights issued a report critical of irregularities in the Attorney General's investigation. A spokesman for the Attorney General's office, Juan de Dios Castro, praised the human rights commission, but said: "we're convinced in our view and we acknowledge our differences." Will's friends organized a letter-writing campaign to convince Judge Rosa Iliana Noriega to drop the case against Martinez, arguing a lack of convincing evidence. But they never received a response. Vilchis has now returned to Mexico, and is helping with the grassroots effort to defend Martínez, who is being held in Oaxaca without bail. He believes Martínez's detention allowed the Mexican government to demonstrate progress on Will's murder case while hurting the protest movement. "In Mexico it's very common to pick someone up, torture them, and they end up confessing to something they didn't do," said Vilchis. "Those people tend to belong to an organization, they're activists involved in social movements. If they get this person, they can get back at the organization and destroy it." Ricardo Alday, director of the press office at the Mexican Embassy in Washington, D.C. declined to comment on the case. "Hope is our greatest struggle," Vilchis said. "Sometimes you don't know where it comes from, but there's always someone in worse conditions than you." Mari Hayman is a Journalism student at New York University. This article was originally published on NYU Livewire (journalism.nyu.edu/pubzone/livewire/).